Todays defence related news includes coverage of the fourth Illegal Wildlife Trade Conference and reporting that the UK has paused flying of some F-35s. Safety is our paramount concern, therefore the UK has decided to pause some F-35 flying as a precautionary measure while we consider the findings of an ongoing enquiry. F-35 flight trials from the aircraft carrier, HMS Queen Elizabeth, are continuing and the programme remains on schedule to provide our Armed Forces with a game-changing capability. We will continue to review the situation as further information becomes available. The fourth international Illegal Wildlife Trade conference began in London yesterday as £900,000 of new funding was announced to develop a new British military counter-poaching taskforce. The announcement builds on the significant success of, and lessons learned from UK’s previous work to train rangers in Gabon and Malawi. These operatives will be deployed to train African park rangers in more effective and safer counter-poaching techniques. Overall the project aims to reduce the number of poaching incidents and capture poachers in order for them to be brought to justice. The UK will work in partnership with targeted countries to provide support for intelligence mapping, interception tracking tactics and operations management. ITV, The Guardian, Daily Mail, Evening Standard, The Times , Forces News (BFBS)and LadBible all report on the £900,000 of new funding to develop a new British military counter-poaching taskforce. The British Army will be deployed to train African park rangers in more effective and safer counter-poaching techniques, with the aim of catching more poachers and bringing them to justice. The coverage also carries comment from the Prime Minister who, in a video message, pledged the UK would do everything to bring down the illegal trade, including taking action domestically, such as the ivory ban. 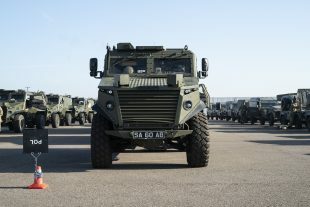 76 vehicles and their troops from 1 Royal Irish and the Lancashire Regiment disembarked into the Hook of Holland this week. Ahead of their near 2,500km onward journey to Norway they prepared their vehicles at a Convoy Marshalling Area before hitting the road in packets of vehicles.